There have really not been very many postings of Teakettle's on the blog. This is interesting since there are so many nice examples in collections. Here is an example with some nice green tone, and whittle. 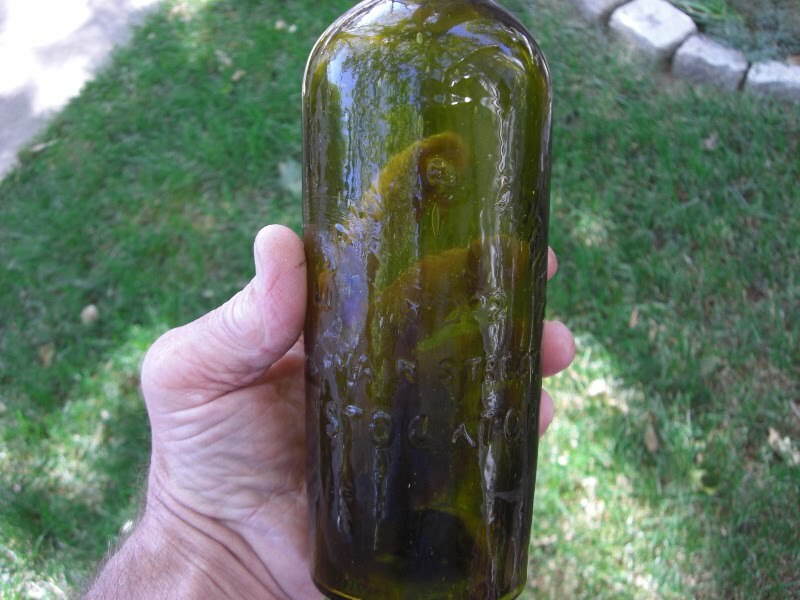 It was found in the famous "Teakettle hole" in Virginia City in 1972. There has been much speculation as to exactly how many Teakettle's were found in that hole, but can you just imagine what J.O. felt when he looked down and saw stacks of Teakettles? I have heard accounts of viewing many of them at the Reno show soon after being dug. Does anyone have a photo? I was 8 years old at the time, so missed that show. It would sure be a nice display at a show to showcase Teakettle's from dark chocolate to aqua! This nice Wolters Bros fifth came from a TINY 2' deep privy on a LONG time vacant lot in an early residential area of Sacramento. This lot has been pounded by "Pro-Fessional" diggers, but the little pit was somehow missed. This bottle was popped out yesterday afternoon by my diggin' partner while I was busy door knockin' to seek permissions for today. I missed out on the fun, but did get a permish on a virgin yard in Alkali. 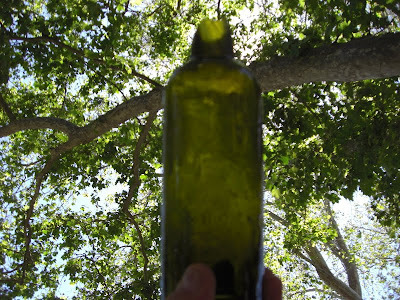 The little seed filled hole held only 2 undamaged bottles, a Jos Hahn pharmacy and this bottle. Everything else was wasted. Go figure, it's usually the other way around. Nice job, Chuck, you 'da MAN! Recently excavated from an 1870s privy. The use layer in which this marble sat for over 135 years was mostly early 1870s with a few 1860s bottles mixed in and the parcel which contained the privy was developed in as early as 1867. If I had to guess, I'd say the marble dates to the late 1860's ???? So far it seems that this particular design may be unique, have any of you other diggers/collectors seen a rabbit scene like this before ? The size is 3/4" and the condition is pristine. 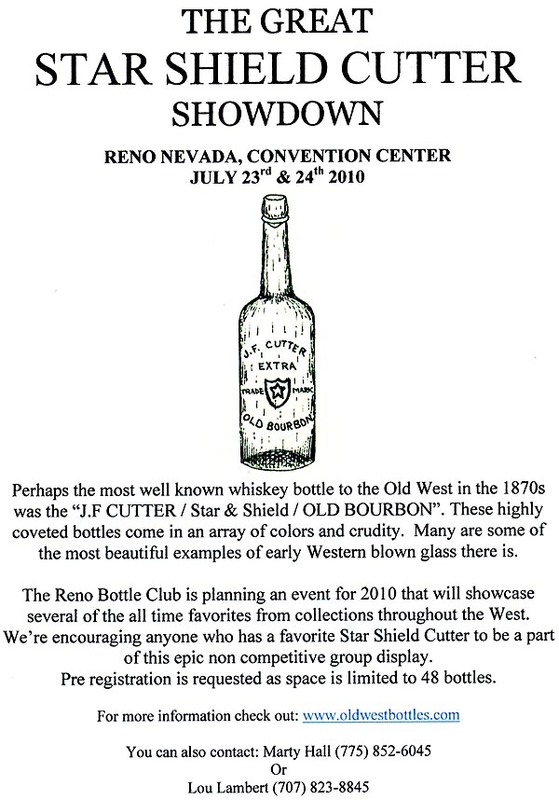 With the Reno show just around the corner, don't forget about being a part of the "Star Shield Cutter Showdown" at this years show. 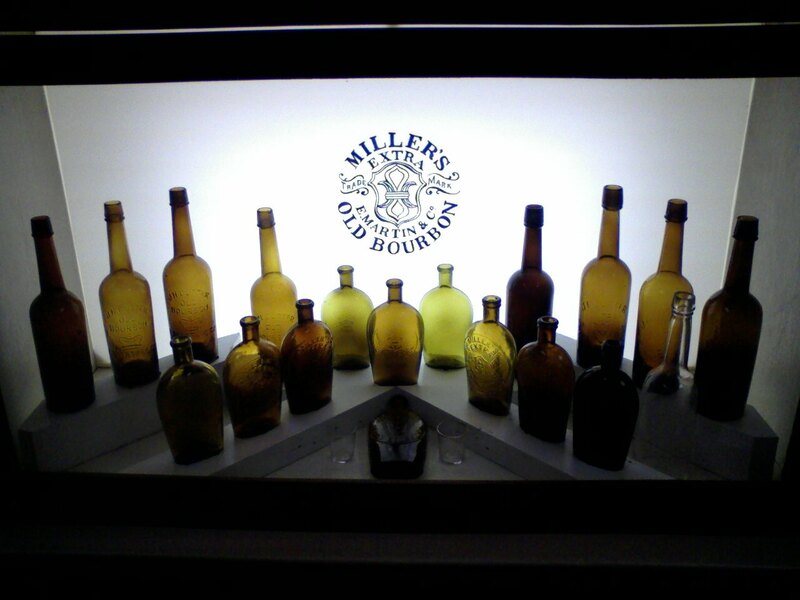 We're a little over 3/4 full with space available for about 10 more bottles. I know some of you guys that haven't already registered have these bottles and it would be great if you could be a part of this epic event. Displays like this attract a lot of attention from both advanced and novice collectors in addition to drawing new blood. Participation is key in our hobby if we want the interest to continue. 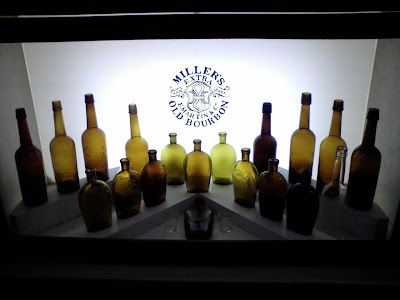 Contact me at lou@oldwestbottles.com if you'd like to display your bottle(s) and check out our "shows" link at: http://www.oldwestbottles.com/ for more informatiom. 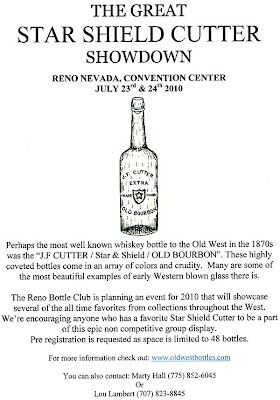 This promises to be one of the best Western whiskey displays of Cutters ever assembled, hope to see you there! A "Crier" with a CAPITAL "C"
This sad bottle was wrenched from it's earthen resting place by a backhoe operator putting in a septic tank in a northern San Joaquin County, CA, burg. After decapitating this beautiful sixth he casually tossed it onto the spoils, leaving it gleaming in the sun, only to be seen by a passing digger. All he could tell from outside the fence was that it had the look of a western whiskey. After inserting a probe under the gate and dragging the remains to the edge he was able to see the star on the base. Thinking that it was most likely a unembossed sixth he reached in and pulled it out into the alley. Turning it over and seeing that it was embossed, he nearly dropped it. OH NO!! Of all the bottles to be shattered by a machine, why was it this one? A major BUMMER, indeed. Here is a nice early sixth that wandered in from Nevada recently. These are very tough to find with all of the characteristics I love in Western glass...nice olive tone, great whittle, and pristine condition. I have not heard of a Chesley's coming out of the ground in recent years. This would be a tough example to top! San Diego Antique Bottle & Collectibles Show!!! San Diego 2010 Antique Bottle & Collectibles Show & Sale! NEW LOWER SELLER TABLE PRICES! This year has simply been one of the best years in memory for GOOD whiskeys! I am feeling like a broken record, but it has. Here is one that turned up far from it's home...along with 17 other glob fifths! This hole started out with Bromo Seltzers and similar quality for the first 5 ft. Then a 2 foot clay cap, and PRESTO CHANGO instant embossed glob fifths for two solid feet in depth, and 5X8 feet in demension. This one is now on the shelf. A HAMMER whittled T-55 Portland Hotaling. I believe there are perhaps 8-10 of these at the most in collections. 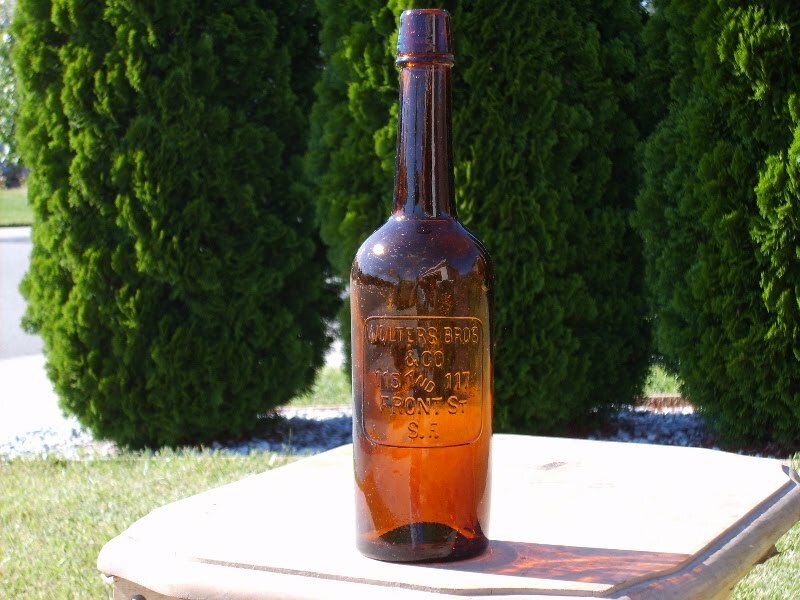 Most are a light honey amber, and are remarkably plain given their age (late 70s) and being non air vented. Every once in awhile "the one" comes out, and this example qualifies to me! It is a chocolate with 100% diamond whittle, bubbles galore, and an enormous top. The embossing is bold and crude. Best of all, in spite of being completely covered in other whiskeys,it is mint. 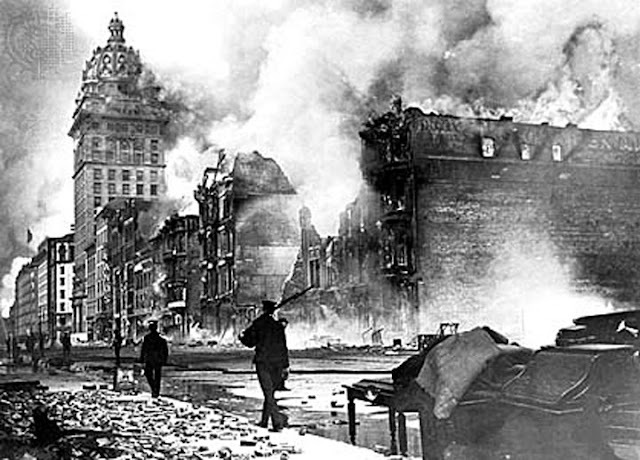 My photographic skills are not good enough to show the crudity, but maybe they can provide an idea of how crude it is.It was not dug in Oregon, and the people involved wish to remain nameless and faceless, but all in all it was one of the most stacked whiskey holes in awhile. I have dug 31 holes since January 1st. At an average of 6 feet each, that is a total of 186 feet! That does not count the many yards of material moved at a large 1860s-1870s dump a few months ago. This time of year, I start to get a tad burnt out, and I tend to projects around the house that I have been putting off all Winter. After all those holes, there have been some nice bottles, and other items, but nothing "heavy" this year. I figure there is about 6 weeks left before the ground starts to get rock hard in my stomping grounds. I dig all over the West, and when I get the "call", I am on the road chasing that next early bottle for the shelf! There are a few permissions that need to be dug, and hopefully I can dig a dozen more pits in the next few weeks. One must just keep at it, and never give up. Here are two of my favorite flasks. They were both dug by tenacious (and fortunate) diggers. I wonder if they knew that the next hole would produce these beauties? This is what keeps me going...knocking on that door, getting rejected or not, moving wood piles, or junk cars, breaking concrete, and breathing Honta Virus laden dust...all for the chance of seeing something like this just laying there...wow, there is nothing like it! 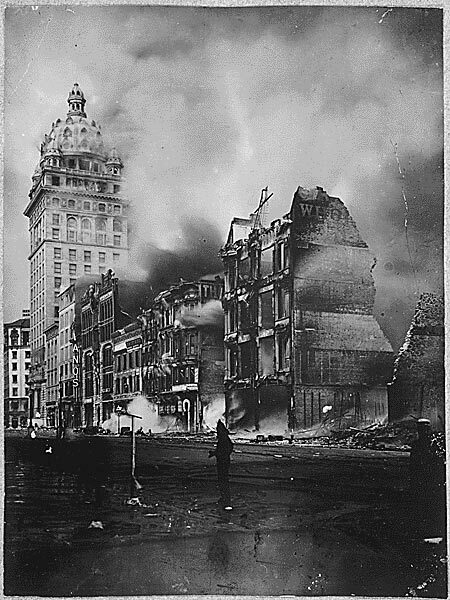 This is what the block looked like around the time of the Great Earthquake and Fire of April 18, 1906. 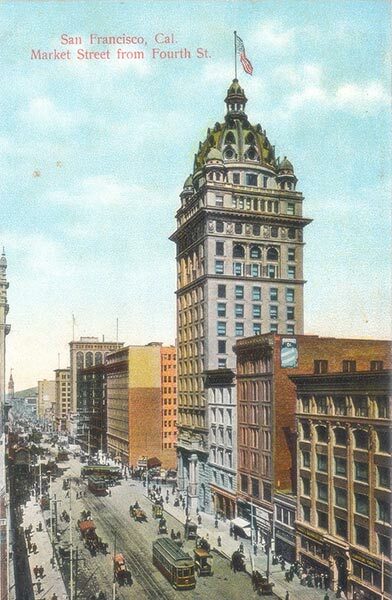 Although refered to as the Call building (because his newspaper was headquartered within), the "skyscraper" was formally named the Claus Spreckles Building. The following Sanborn maps shows the relationship of the "token business" to the surrounding occupancies.